Achieve the exact product for your needs by utilising our custom service and design it yourself. We offer a complete custom design service with AutoCAD details to convey your ideas and our manufacturing capabilities this is always backed up by our detailed and transparent quotations allowing you to see how much each individual item costs and what it does. We realise that not everyone's needs can be resolved by a standard catalogue product. This is why we offer a custom design service on any chart workstation where we convey all your ideas in a full AutoCAD specification drawing which supplements our full quotation and break down. 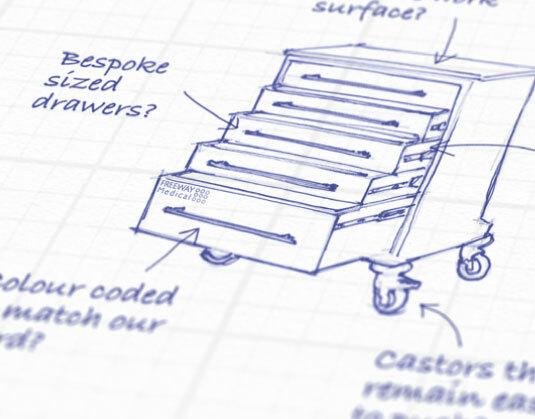 The possibilities for customisation are vast, you can choose to modify an existing product or opt for a completely new, from the ground up product to suit every aspect.We will then advise on cost, function and further still, suggest the options available in order to provide you with the perfect end product. One which suits your every need. We build exactly what you require to fufill only your needs.